This has been a crazy week in the life of our church Staff. In addition to preparations for worship, tomorrow evening we will share some vision with our church community. We have been in a focused planning mode for weeks, writing, talking, sharing, editing, revising, videoing and praying. So it was good to sneak away with Katherine to a movie last night. The movie was okay, but the company was fantastic. It would be fair to say that on a practical level I don’t believe Emerson. 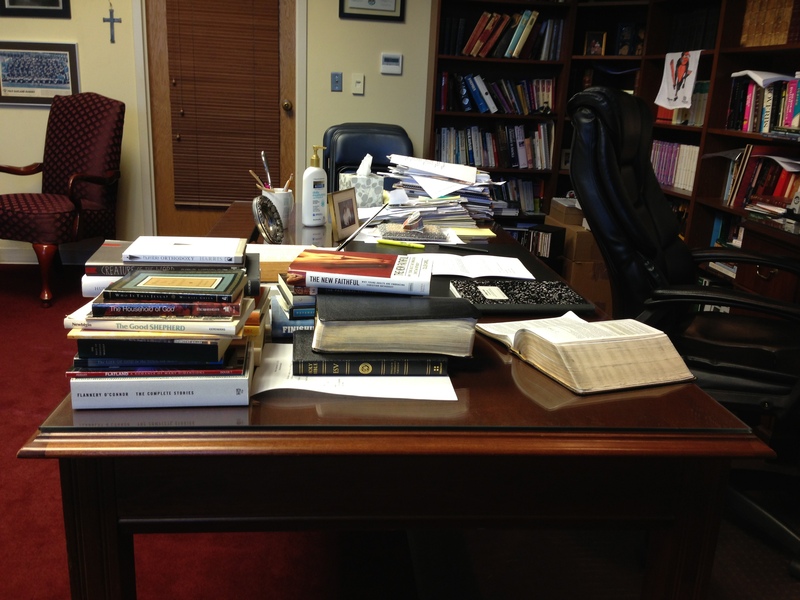 On any given day my desk is cluttered with books, scriptures, papers, notes, letters, cups, pens, markers, letter openers, pictures, and lots, that is, tons – we’re talking piles and piles of things to do. Maybe that desk is reflective of my head and life, kind of in the way we guys assume it is for women and their purses (but why go there?!). This morning as I left my office for Starbucks, I reflected on this, and the conclusions were like those personality tests where you feel great when you see your good qualities, and then turn to despair over the negative results. While I have the capacity to get a lot done in a day, there are darker angels that shape my profile, and one of them has to do with an unwillingness to stop. I don’t want to get too deep here, but there seems to be something terribly idolatrous about an unwillingness to let go of the day. In one sense, we are always unfinished, so to hold on is to galvanize a moment God intended to pass, in taking us to the next. The cost can be immense, and the joy we are intended to experience each new day – with those we love, and even within ourselves, is often squandered in restlessness. The alternative is to flee to Jesus – to actually stop and believe that His invitation to come to Him with our weariness (Matthew 11:28-30) will relieve us of the impossible burden of finding our value in work, and the other unfinished realities of our lives. I actually didn’t read this until today, which was just when I needed it. I look back on my days sometimes, and just see what I should have or could have done with my son. It’s a good reminder to shift that focus to where it should be. As always…just what I needed to read today! Thanks Mike!!! You are currently reading Finishing to Death at unfinished1.